If The Internet Is Your Canvas, You Paint In Zeros And Ones : All Tech Considered In early October, Benjamin Palmer dropped $3,500 at Phillips auction house in New York. His acquisition? Ifnoyes.com — the first website to be sold at an established auction. It highlights the growing acceptance and appeal of artwork that lives in a virtual space. Ifnoyes.com sold at an art auction in New York for $3,500. The artist, Rafael Rozendaal, compares owning a website to owning a public sculpture in a park. That Benjamin Palmer dropped $3,500 at Phillips auction house in New York is not surprising. The 217-year-old company, headquartered on Park Avenue, regularly sells artwork for tens — and often hundreds — of thousands of dollars. What is surprising, however, is that he took nothing home. He has nothing to put up on his wall or put on a pedestal in his living room. Physically, his acquisition lies among a hub of wires, and the likelihood is he will never touch it. But it lives virtually inside every computer, smartphone or tablet in the world. 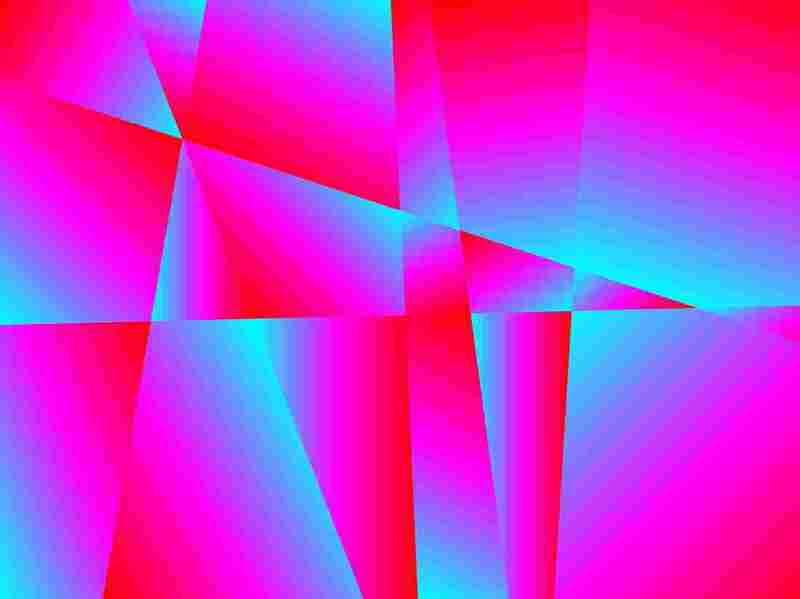 Palmer's purchase was ifnoyes.com, a Web page with colorful geometric patterns that respond to the movement or click of a mouse. "Being in such an old-school place and then just buying a website felt like a perfect thing to do," Palmer says. "It was like, this is what I should be doing." That night, he did the virtual equivalent of hanging a painting up on his wall: He reposted a picture of it on Twitter. Art and technology have been close bedfellows throughout history. Artists have employed advances in paint pigmentation, photography, pencils, video cameras, computers — basically anything since the invention of fire, says Steve Dietz, president of the Minnesota-based new media nonprofit Northern Lights.mn. "Technology is anything that people can use to make something, and artists have always been looking at what are the new tools that are available," he says. Digital art dates back to the mid-20th century: In 1968, an exhibition in London called Cybernetic Serendipity curated the work of computer-based artists and served as a sort of debutante ball for the field. Web-based art in particular has been growing since the advent of the Web in the mid-'90s. But the event at Phillips — an art institution known for auctioning off Impressionist paintings and Andy Warhols — signals a widening acceptance of the digital field by the mainstream art world, Dietz says. Phillips' director of digital strategy Megan Newcome says the auction in early October, called "Paddles ON," was the first to be dedicated entirely to new media. 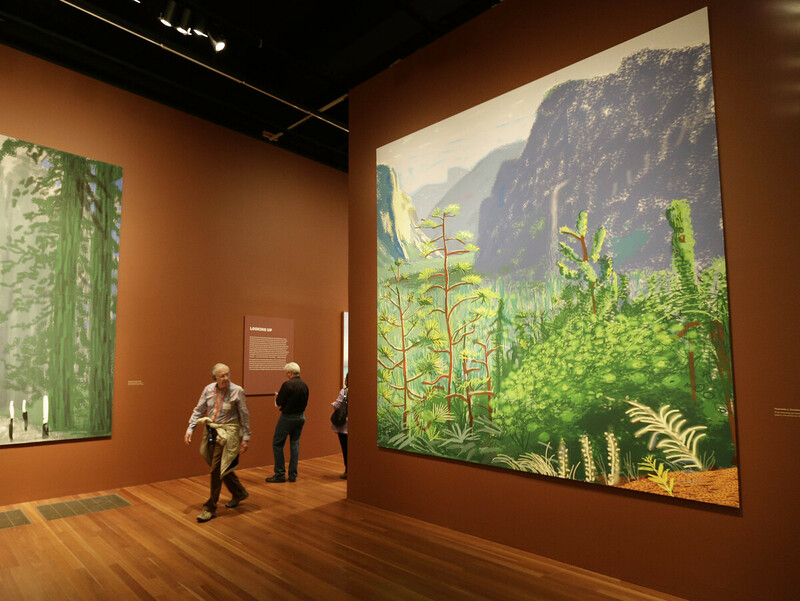 These landscape paintings of Yosemite National Part were made by renowned British artist David Hockney using an iPad. "We continually position ourselves as contemporary, and every 50 years that changes," she says. "We just got this sense that what we were doing was, in a way, unprecedented." The 20 works of digitally inspired art for sale spanned the spectrum from physical to virtual: a baroque chandelier with surveillance cameras instead of lights, a digital print with embedded touchscreen tablets, an 8-hour performance video by Tumblr sensation Molly Soda, an animated GIF. Newcome says collectors were initially drawn to the things that "they can wrap their minds around" — the more traditional tangible pieces. But the event, she says, helped some collectors realize that digital works are now part of mainstream contemporary art. "The fact that this was an exhibition and a panel discussion and a party, this real celebration of digital art ... we were really able to give it some muscle," Newcome says. And it's not the only art establishment to begin embracing the virtual side. The American Art Museum in Washington, D.C., had an exhibit dedicated to video games last year. In August, the Cooper-Hewitt, National Design Museum in New York acquired its first piece of code — an iPad application. And David Hockney, whom the Associated Press calls "one of Britain's most celebrated living artists," brought mainstream attention to digital art when he began drawing on his iPhone and iPad about five years ago. His digital drawings are now being shown in San Francisco's de Young Museum. Hockney told the BBC in 2010 that he was drawn to the responsiveness and immediacy of the medium. "Who wouldn't want [an iPad]? Picasso or Van Gogh would have snapped one up," he said. But Picasso and Van Gogh created unique, irreplaceable paintings worth millions of dollars. What's the incentive to invest in art whose very nature is reproducible? 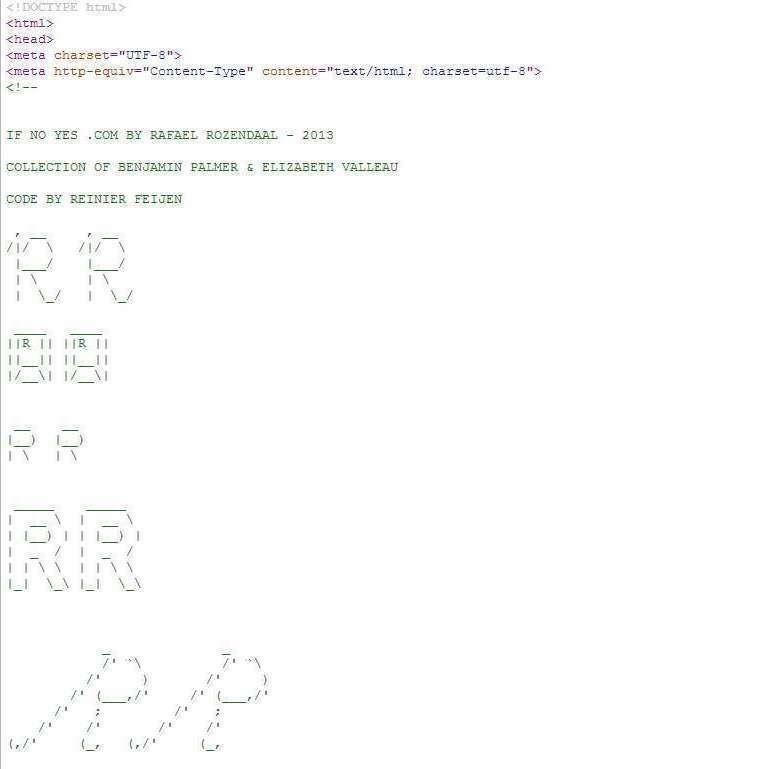 The source code of ifnoyes.com shows the new owners' names and a signature, of sorts, from the artist. "The question of ownership — and how you get someone to pay notoriously high art-market prices for something as relatively immaterial as Molly's webcam video or a 24-second YouTube clip — is still unsolved, and what the organizers of Paddles ON repeatedly called 'the elephant in the room.' "
The creator of ifnoyes.com, Dutch-Brazilian artist Rafaël Rozendaal, points out that websites do have intrinsic worth: In the Internet realm, domain names are financially valuable. No one but Palmer and his wife own the URL "ifnoyes.com," even though everyone can access it. Rozendaal even made Palmer sign a contract to keep the website free and accessible to the public. "My work is public by nature," Rozendaal says. "I want to keep it that way." It's the virtual equivalent of owning a sculpture in a public park, he says. There's a point of pride of being the one who commissioned or paid for it. And the site still identifies the owner: The title of ifnoyes.com says it's a "Collection of Benjamin Palmer & Elizabeth Valleau." It seems to be working for Rozendaal: Of the 85 websites he has designed — all of which were coded by an independent programmer — he has sold about a third. He says this one is the first website ever to be sold at an art auction. For Palmer, the medium is appealing because he can share his acquisition easily. He doesn't have to invite people to his living room to see a painting; they can just take out their phone. "I think it's pretty exciting to kind of have it with you all the time," he says. "I like the idea that it's for everyone."